Many times in our lives we trained or studied for something for months at time and it all came down to the moment of truth and something happened that threw us off track. You can either throw you arms in the air and give up or adjust accordingly and see if you can make the most of the situation. Our ability to adapt to the situation depends on our behavior. By staying positive, we can come up with ways to address the challenge we’re facing. However, if you get frustrated, you’re most likely to fail at it. It all comes down to how much you really want it and if your sacrifices can be thrown out the window. The term “choke” in my observation is really an unfair assessment. 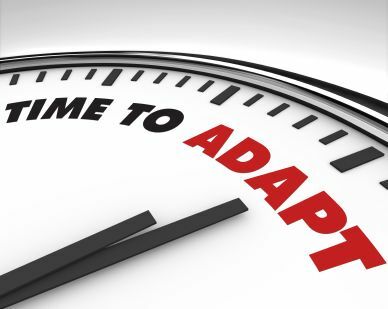 Some people take more time to adapt, while others can easily adjust and move forward. However, there are many situations in which time is of the essence, where if you hold back a little, you’ll miss out on the opportunity. But at the end of the day the outcome is less important than the fact that you did your very best to adapt to the situation. The experience you gain goes a long way. 1) The son of a friend of mine recently tried out for a swim team. During his butterfly event, I noticed that he slowed down significantly and was left behind by almost a lap. I was puzzled but was not sure what happened. He did not quit and kept on swimming. At the end of the tryout, I asked him what happened. He said that his goggle was loose then eventually fell into the water. He decided to keep on swimming and not worry about it. Such an act demonstrates his commitment to getting it done no matter the situation. He did not make any excuses and kept on swimming. It must be hard to finish last, but the way he did it made me so proud of him. I told him that no matter what the outcome, he should be proud of his effort. 2) Nathan Adrian competed at the 100-meter freestyle at the Indianapolis Grand Prix. While crouching on the block, he felt a tear on his rear. This left him with an exposed buttock. In spite of that he went on to swim and ended up beating Michael Phelps at that event. He did not let the incident affect him, because months of practice all came down to that moment and he did his best and was rewarded nicely. 3) Last year, I was hoping to have my promotion. When the day arrived, my manager was surprised that I did not get my promotion. To say the least, I was disappointed. But I did not let it stop me from doing a great job and continued to coach and mentor people around me. Although I was affected, I channeled my energy to working with the new management and continued to help affect change in our organization. I never wavered and believe that one or two setbacks should not stop me from trying. The year went by and I was surprised that I got promoted to Executive Director. It goes to show that we need to try your best at all times and do not let some setback hold you back. You should continue to strive to achieve your goal. The lessons learned is that we cannot give up easily for we will never know the outcome if we quit too early. Step back and try to take a deep breath. Go out for a walk and allow yourself to mourn and deal with the situation. Accept the situation and acknowledge it and move on. Try to see the positive side of the situation. This often includes controlling your emotion and focusing on the task on hand. Find alternative solutions and weigh the feasibility of getting it done. Proceed with your decision and act on it. For the above swimming situation, you cannot obviously apply some of the steps defined above, but you get the point. Act on the situation based on how important it is to you. Make a commitment and make it happen. When you commit, it makes going forward easier. I am extremely inspired with your writing abilities as smartly as with the structure in your weblog. Is this a paid topic or did you modify it yourself? Anyway keep up the excellent high quality writing, it is uncommon to look a nice blog like this one today..